Santa Monica is an unforgettable seaside city, with easy access to metropolitan Los Angeles and the rest of Southern California. Equal parts coastal getaway and urban center, Santa Monica serves as a perfect base for vacationers and business travelers alike. Also known as Downtown Santa Monica, Inc., this neighborhood hosts some of the city’s biggest stores and most famous retailers as well as two weekly farmers’ markets. The open-air, pedestrian-only Third Street Promenade is a huge draw for its shopping, dining, street performers, bookstores and movie theaters. Offering direct contact with the beach and ocean, the famous Santa Monica Pier houses a Carousel and full over-the-water amusement park, while palm tree–lined Ocean Avenue has an array of prized ocean-view restaurants and hotels. Mid-City’s wide thoroughfares are home to a variety of shopping, dining and pubs, many major film, television and music companies, as well as the city’s newest performing arts venue. Main Street offers chic clothing and design stores, art galleries and a weekly farmers’ market just two blocks from the ocean, as well as the Santa Monica Walk-In Visitor Information Center. Montana Avenue is a tree-lined European boulevard amid a residential neighborhood with casual yet luxurious dining and shopping options. The highlights of Pico Boulevard are the record stores and a huge Saturday farmers’ market, not to mention the award-winning restaurants and clothing boutiques. Ocean Park is a friendly, artsy neighborhood with a wide variety of stores, galleries, coffee shops and a culinary arts restaurant. Santa Monica Airport is a working, private airfield and events space, home to outstanding restaurants, the monthly Outdoor Antique Market and annual Barney’s sale at Barker Hangar. St. Anne Chapel was founded in 1908 and the St. Anne Church and Parish were established in 1951. 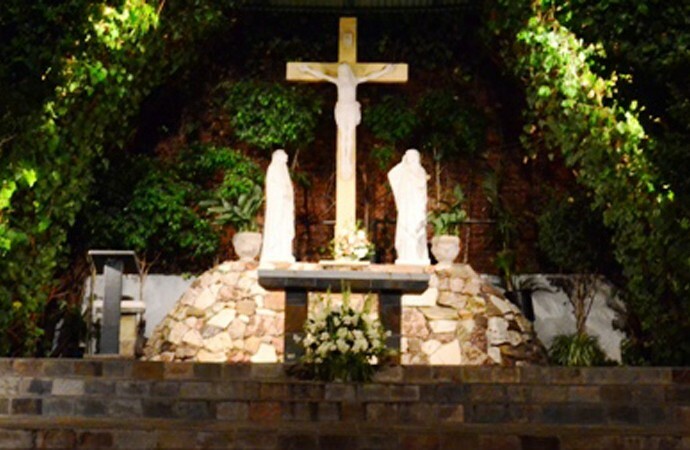 St. Anne is a bilingual parish, holding masses in English and Spanish. We have no certain knowledge of St. Anne. She is not mentioned in the New Testament, and we must depend on apocryphal literature, chiefly the Protoevangelium of James, which dates back only to the second century. In this document we are told that Anne, wife of Joachim, was advanced in years and that her prayers for a child had not been answered. Once as she prayed beneath a laurel tree near her home in Galilee, an angel appeared and said to her, “Anne, the Lord hath heard thy prayer and thou shalt conceive and bring forth, and thy seed shall be spoken of in all the world.” Anne replied, “As the Lord my God liveth, if I beget either male or female, I will bring it as a gift to the Lord my God; and it shall minister to Him in holy things all the days of its life “ And thus Anne became the mother of the Blessed Virgin Mary. 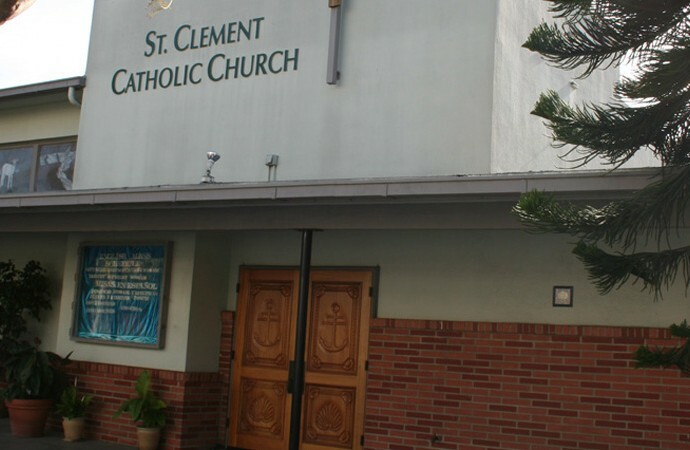 St. Clement was called into existence in the year 1904 by Bishop Thomas J. Conaty and has endured many changes in its 109 years of existence. Today it is still adapting and looking into the future in order to better serve its faithful. St. Clement was the third successor of St. Peter, and probably a contemporary of both St. Peter and St. Paul in Rome. St. Clement is mentioned in the ancient First Eucharistic Prayer (also called the Roman Canon), and may be the Clement who is mentioned by St. Paul as a co-worker in his letter to the Philippians (4:3). A church near the Roman Coliseum named in Clement’s honor consists in four separate layers, the first dating to the first century A.D.
As bishop of Rome, Clement wrote several letters. He proclaimed the tradition, which he had recently received from the Apostles Peter and Paul. Pope St. Clement I urged unity in Christ and tried to reestablish peace and renew faith. His authoritative letter made his name famous. Roman emperor Trajan exiled him to Crimea where Clement worked as a slave among rock quarries. Although the closest water source for the slaves was thought to be about six miles away, Clement was inspired to discover one much closer where they could drink. Clement preached the Word of the Lord so effectively among the slaves working the rock quarries, that within a short time 75 Christian communities were developed in the vicinity. He was then cast into the sea with an anchor tied around his neck. His image is portrayed with a large anchor next to him. He is dressed in the garments of a bishop (red for martyrdom), wearing a mitre (pointed hat) and holding crozier (shepherd’s staff). It is said that angels prepared a sepulcher for him under the ocean waves, and perhaps that is why several places near the waters of Southern California are named after him: the Channel Island of San Clemente, the seaside town in Orange County, and the St. Clement parish on the Santa Monica-Venice border. 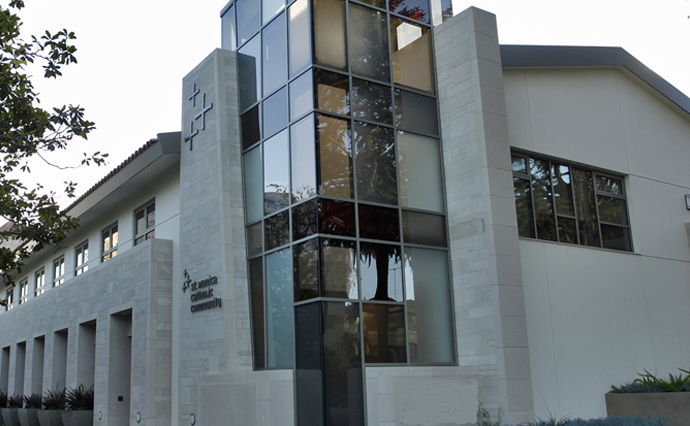 St. Monica is a diverse and vibrant community of faith who believes and professes the gospel of Jesus Christ in the living tradition of the Roman Catholic Church. Our mission is to form loving disciples who will transform the world. The church, located at 7th and California Streets, was erected in 1926. Copyright © 2019 Catholic Parishes of Santa Monica All Rights Reserved.